We've looked around for the month's best finance offers - including free insurance, breakdown cover, servicing plans and more. Citroen's SimplyDrive bundles up servicing, insurance, tax, finance and breakdown cover into one monthly payment - available on most models. The C4 Cactus is available with a £1900 deposit contribution and 0% APR. Get a new Dacia Sandero for £89 per month on finance, with a £400 deposit contribution and five year warranty. Two years/24,000 miles service plan from £11.99 per month, three years/30,000 miles service plan from £11.99 per month or three years/36,000 miles service plan from £13.99 per month. Fiat's £299 monthly Be Free package - available on the Spider 124 - offers the Full Maintenance package to ensure monthly servicing costs are set at a fixed price, Breakdown Cover and Roadside assistance across Europe and the UK and a free GAP waiver. The Honda Jazz, CR-V Black Edition and HR-V Black Edition are available with 0% APR and five years complimentary servicing - which would usually cost £1195. One years free insurance, £500 toward your deposit and 4.9% APR on the new Kia Picanto and Kia Rio until 30 September. Free upgrade from Optima Saloon to Optima Sportswagon. If you own the previous-generation Sportage you can also receive £500 off the purchase of a new Sportage or Sorento as part of a loyalty offer. Customers who register either model before 30 September will receive a free three-year Kia Care-3 servicing package as well. £750 deposit contribution and two years free servicing on PCP offers for the CT 200h Sport and CT 200h F Sport. £1500 deposit contribution and two years free servicing on PCP offers for the the IS 300h Sport and IS 300h F Sport. Micra available for £199 per month, 3.99% APR, £1600 deposit contribution, two years servicing for £249 and three years pan-European roadside assistance. The new Clio and Captur are available with 0% APR and two years free servicing. 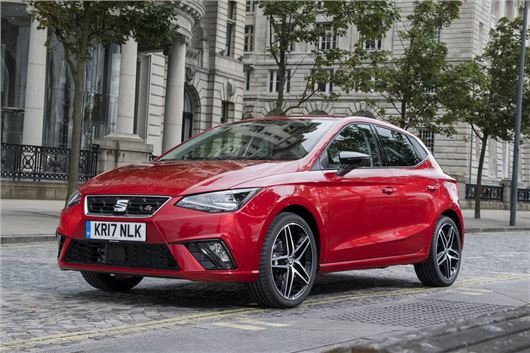 The all-new Ibiza FR comes with £1500 deposit contribution and one year's free insurance (ends on 31 July 2017). Save an extra £500 when you test drive any new SEAT. Outback and Forester models are interest free for one year. This finance offer also includes a five year warranty, with £2500 deposit contribution on the Forester and £3500 on the Outback. The new Prius Plug-in and Prius+ are available with £1000 deposit contribution and two years/20,000 miles free servicing. The Yaris Hybrid, Auris Hybrid and RAV4 Hybrid are available with two years free servicing and 0% APR. With the Golf Event you can get £1000 towards your deposit until 24 July. The Volvo V40 is available with £1000 deposit contribution and three years complimentary servicing when financed on Personal Contract Purchase with Volvo Car Credit.